In November, ESPN The Magazine fanned out to high school football stadiums across this great land to get a baseline read on what folks with a stake are thinking about concussions. Our confidential survey was answered by 600 people (300 players, 100 coaches, 100 parents, 100 athletic trainers) in 23 states. Turns out, everyone agrees concussion awareness is at an all-time high. But one group was singled out by the other three as the biggest block to diagnosis and prevention. Says one longtime trainer in Illinois, "Everyone is doing their part, except the player. If you are concussed, you don't play. But players won't accept that." Rate the level of concern (1 = most concerned; 4 = least) about concussions within each group. When we asked everyone to rank the groups, including their own, the extremes were consistent: Trainers worry most, players worry least. After that, though, consensus breaks down. 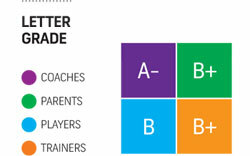 Coaches rank themselves second; parents say they're No. 2, and athletic trainers side with the coaches. "They do the best they can under the circumstances," says an Ohio trainer. "And circumstances are: Players don't want to sit out, and parents are almost as bad. I find myself buckling to that pressure more than I'd ever imagine." Way more than half our respondents -- 375, to be exact -- went with "the right amount." Says a Florida parent, "That's not something you want to rush." But 62 voters grumble that players have to sit too long. "Now that it's a big issue, athletic trainers are on the cautious side," says a Pennsylvania coach. "As soon as a player gets hit in the head and has a bit of a headache, trainers think it's a concussion." Your team is in the state title game, and your star gets a concussion. Would you rather lose the game as he sits out, or win it because he chose to play with it? 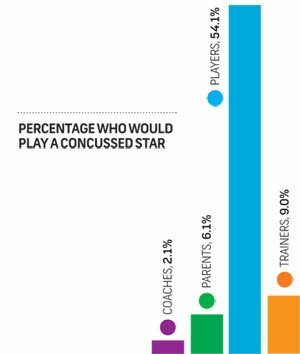 Very few coaches say they'd rather win with their concussed star, and parents and athletic trainers basically agree. "You're risking the kid's health," says a Pennsylvania trainer. "Plus, if he has a concussion, his reaction time won't be where it should be, so chances are good he'll help lose the game." Players, of course, see things quite differently. "We actually have a chance this year," says an Oregon player. "We will all do whatever it takes to win." If a player complains of a headache during a game, should he be allowed to return to it? As many respondents note, a headache can be symptomatic of everything from a contact lens issue to a sinus infection. But most also acknowledge what studies show: The No. 1 symptom of a concussion is headache, and players complaining of one should be held out until a clear diagnosis is reached. "If a player has a headache from a hard hit," says a Minnesota athletic trainer, "it's not okay to return." Only the players believe a headache shouldn't warrant a benching. Is a good chance of playing in the NFL worth a decent chance of permanent brain damage? A majority of each group answers in the negative. One exasperated parent wonders, "Who'd answer yes?" Actually, more people than you'd think: 134 of 300 players say the risk is worth the reward. Says one Texas blue-chipper who is being recruited by just about everyone, "It's a health or wealth question. I choose wealth, and I bet lots of other players will too." Nearly one in five coaches thinks it's worth it too. "I played the game myself, at a high level," says one Pennsylvania sideline vet. "And I'd have said the same thing I'm saying now: Football is a profession, and people go to great lengths to reach the top of their profession." If a player gets a concussion one weekend, what are his chances of playing the next weekend? Our panel of 600 does fall on the side of caution once a concussion is diagnosed; nearly three of four responded either "no chance" or "doubtful." Says one Georgia player, "My coaches sort of say, 'You're not playing,' and it takes a lot to convince them to change their minds." Grade -- A to F -- the condition of your team's helmets. Pass or fail, the groups agree funding is an issue. "My school says we don't have money for new helmets or for fixing up old ones," laments a Michigan linebacker. "I have the same beat-up helmet I had last year." Players, by the way, hand out more F's (12) than the other groups combined (four).